Over the span of many decades Aztec tribal democracy was replaced by an imperialistic monarchy. 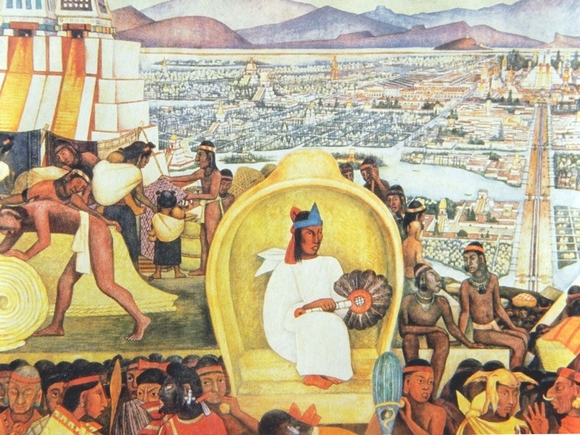 At the head of this imperialistic monarchy stood the leader, the emperor or king, a man the Aztecs called “tlatoani.” The tlatoani lived in an incredible palace with his family and advisers. The highest ranking people in the Aztec government were called tecuhtli. Generals, chiefs, judges, even the emperor and the gods of the Aztec religion carried this title. However, priests rarely carried this title. A tecuhtli was always a man of importance. It was the tecuhtli that the Spaniards called caciques. The tecuhtli wore distinguishing jewels and clothes and their name always ended with -tzin. They all lived in palaces, and were supported by the people of his village or town. It was their duty to represent the people of his village before the higher authorities. They oversaw the production of the fields, judged law-suits, served as the local military commanders, and most importantly they made sure that tribute or taxes were paid to the calpixque or tax collector. Sons of the tecuhtli were called pilli. It was a title that meant that they were the sons of someone important. It was from among the pilli that the emperor usually chose his judges, ambassadors, and officials. Commoners were called maceualli or plebian. Maceualli could also climb high in the Aztec governmental hierarchy, however his success depended almost exclusively on his bravery during battle. Each district in Tenochtitlan had its own chief and he was called the capullec. The capullec was elected for life and was confirmed by the emperor. Under him worked a council of elders who were called the ueuetque. The capullec never did anything without first seeking advice from the council. The capullec's chief responsibility was to oversee the cultivation and distributorship of the agricultural land. As a form of compensation for his job he was not required to pay taxes. Everyday the capullec would go to the emperor's palace to receive his daily orders. Once at the palace, he would receive his orders directly from the representative of the emperor who was called the uey calpixqui. Working under the capullec were officials who oversaw groups of twenty to a hundred families for the purpose of public works, cleaning, and collection of tribute. Directly under them were the civil servants. This included a vast amount of book keepers who kept track of everything. The calixqui were the working administrators in the emperors palace. This word in Nahuatl means, “house attendant.” They were chosen from the pilli, and they were in charge of the cultivated lands set aside for tax payments. They were required to send the emperor reports on agriculture and commerce. If a famine broke out, it was up to him to open up the public stores of corn and grain and distribute them according to need. A calpixqui lived in the capital of each province. He was aided in his chores by a vast amount of scribes who prepared reports and kept records of all tribute received. Judges were also appointed officials. The emperor was very careful in his selection of judges. Drunkards and people believed to be easily bribed were not appointed. Once appointed they had enormous power. Also, even the highest officials could be arrested. No one had immunity from the law. The church was an equally important branch of the Aztec government. The highest level priests held the title of tlenamacac. The tlenamacac served on the electoral board that chose the emperor. It was from them that the highest ranking dignitaries in the Aztec church were taken. Two high-priests ruled the church and they were equal in power. They were so respected that the emperor went to them for guidance. Under the two high-priest were many others who were responsible for the worship of individual gods or a particular religious activity. The church had tremendous assets. They owned vast amounts of land and buildings, and the emperors and people gave them temples and the priests lavish gifts.